Here we go again. Another installment from Instagram. I have made rather a few cheeky purchases this month, damn blogger hype and me having zilch willpower to resist a new product to try. In fact only last week my account was frozen, rather annoying as I was at Clacket Lane services *cue major embarrassment having your card declined in Maccy D's*. So I called the bank and apparently there had been a lot of unusual activity also known as a becky online spending spree. After 25 minutes on hold and a dozen security checks Barclays were happy that it was me making the charges and reinstated the card just in time for me to pop to Boots and test it out. Speaking of Boots I seem to have accumulated a lot of advantage points lately which I shall definitely be taking advantage of soon. 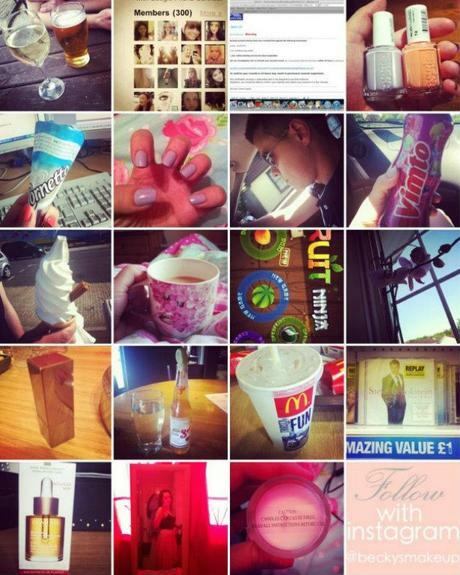 Drinking by the river, 300 followers, fraud email, more Essie, Boss bringing ice-cream, Lilacism, BF, Vimto, Ice-cream, Mum bought tea in bed, Fruit Ninja, Orchid lives, Burberry, more drinks, Bank Hol' Maccy D's, Z listers in £ land, Clarins, New skirt, Caution! Feel free to come and follow me on Instagram as beckysmakeup.